Welcome to Day 06 of Half Hour of Power! I’m actually a little bit surprised I managed to put an article out every single day for a week. But I think this little experiment has thus far been successful, to some degree at least and I’ve enjoyed playing and discovering several new games that I’ve been bereft of playing for far too long. One such title is today’s pick: an interesting little racing game called Nimbus. In Nimbus, you play as a sentient space ship whose girlfriend has been stolen away by the Eye of Sauron’s anime-cousin. Your quest is to navigate through various obstacle filled levels as quickly as possible in order to, presumably, reach and defeat the evil abductor and rescue your one true space-love. It’s a quirky little title with not a whole lot to offer at first glance, but fairly interesting level design and a relaxing soundtrack save it from being “just another indie game”. My takeaway facet of this game is more so it’s overall lack of polish and finesse rather, than any one glaring issue or triumph. It’s definitely a good game from the time that I spent with it, and certainly has that addictive quality that these types of games need to thrive, but a few poor implementations of various ideas really hold it back from being true quality. So, let’s address those negatives. The best love story since Romeo & Juliet. The first problem I noticed upon starting up the game was that though it allowed for a gamepad input device, it didn’t have any sort of visual change to indicate that it was recognizing the controller. It still said press “Ctrl” to continue and “Shift” to refresh scores. After a bit of experimentation, I got the controls down pat, but the disconnect from not being able to see and absorb what action each button performed hindered the immersive quality of the game. The next complication was apparent shortly thereafter when, upon completing the first level, the world leaderboard wouldn’t load. I thought nothing of it and started up the next level only to be met with a completely opaque blue text box informing me that my scores couldn’t be uploaded and that the game would try again later. It was very intrusive and obscured the entirety of my screen. Admittedly it did fade in and fade out, allowing for my play to not be quite so interrupted as it could’ve been, but these two issues are just play testing 101 to me. Very easily discernible to anyone playing and similarly simple fixes and would show an attention to detail that separates the good from great. 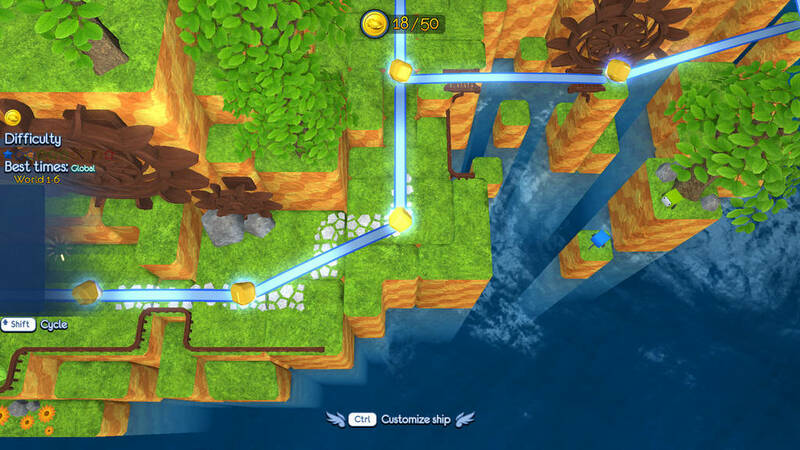 Though speaking of attention to detail, another glaring quandary about Nimbus is the lack of cohesion between the over-world map and the design of the actual levels. 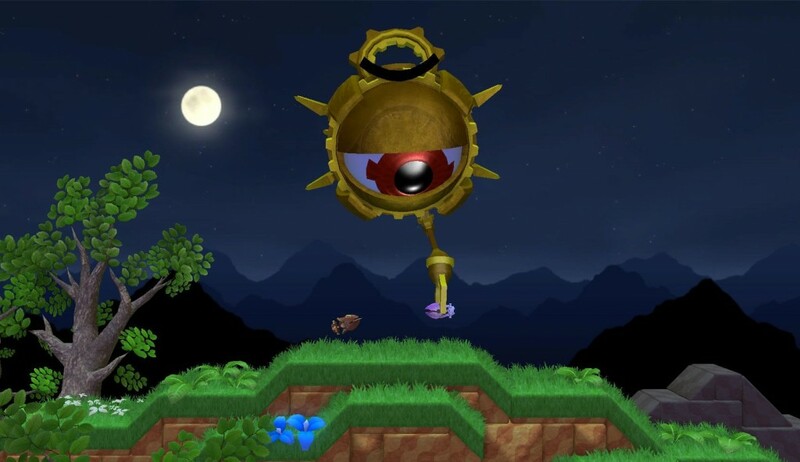 The most obvious of which is that levels in World 1 occur at night, as evidenced by the moon and stars in the dark sky, and yet there’s no indication of this in over-world itself. Again, this seems like a common-sense move to me as this is ubiquitous to games of this nature. Lastly, one a game selling itself on a speed mechanic, it seemed rather inconsistent how exactly my intrepid explorer gained said speed. On some levels a downward decent would rather a lot of speed, whereas others relied solely on bounce-pads for swift flight. I would have liked to see a more consistent base speed for free-fall and have the various object modify the velocity on top of that. The over-world is nice, but rather inconsistent with the levels themselves. However, let’s not rest on the laurels of negativity any longer. There’s far more good about Nimbus than bad and my experience with the game as left me satiated, yet also yearning for me. 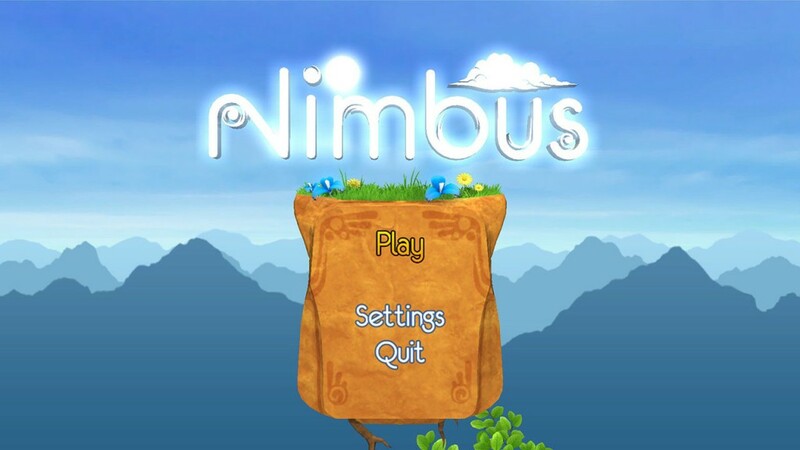 Given that Nimbus is a time-based game, the inclusion of an automatic level-restart button is a brilliant design choice, albeit one that should be a no-brainer as well. Additionally, the controls were always smooth and responsive and I never felt like I was wrestling with finicky movements as I navigated various spiked labyrinths. Though I will say the controls aren’t initially the most intuitive I’ve used, after a level or two it’s very easy to fall into a nice rhythm. The treasure system must also be given some applause, as I spent an additional 20 minutes attempting to find all the hidden coins in World 1 (a misguided attempt to unlock a boss-fight I incorrectly assumed was there; it was in actuality branching pathways for hidden levels, which are an awesome addition!) only to currently still be stumped by the coin in World 1-8 and both of the secondary exits I’ve discovered. These sorts of challenging auxiliary objectives really drive home the experience for me. Furthermore, because I’m something of an achievement hunter (a mild way of putting it, to be sure), I noticed that some levels had specific time requirements for unlocking various achievements. The first of these, World 1-9, has me stumped in terms of execution, but I know how I have to navigate the level. It’s just another layer to the game that’s nice to have as a buffer for what could essentially be an hour or two breeze through. Overall, Nimbus is a nice little game to pass the time with and a pretty good title if you’re looking to chase leaderboard positions. It’s fairly well-thought out level design and tight controls make for a fun play, but some small annoyances and lack of forethought hinder it from being truly great. That being said, it wouldn’t surprise me in the least if I managed to take down all of the levels on a least normal difficulty and grab all the treasures. Till next time!